The following is a reference/historical listing of the 70-millimeter engagements of “Big Trouble in Little China” in North America. 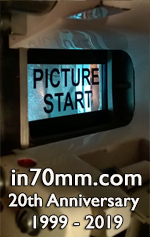 This 70mm release consisted of full-frame prints (2.20:1) blown up from anamorphic 35mm photography. The audio was Six-Track Dolby Stereo (“A” encoded). “Big Trouble in Little China” was among sixteen 1986 first-run films released with 70mm prints for selected engagements. The 20th Century Fox release—directed by John Carpenter and starring Kurt Russell and Kim Cattrall—opened on July 2nd, 1986. This information has been referenced from film industry trade publications and regional newspaper promotion, with thanks to Bill Kretzel. International and second-run/revival engagements have not been accounted for in this article.